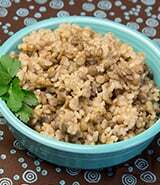 Separately wash the lentils and brown rice, place in a heavy pot, add water, cover and let soak 1 to 2 hours or overnight. Add the salt, cover, place on high heat, and bring to a boil. Reduce heat to medium-low and simmer 50 to 55 minutes. Remove from heat, let sit covered 10 minutes, and place in a serving bowl. Garnish with parsley and gomasio when served.